Business travelers are as likely to find themselves in Seoul or Bangalore as they are on Sand Hill Road. But where to meet, eat and check e-mail? Not to worry. Our city-by-city list details the best places to get things done, no matter where you are. The city is home to Infosys, Google's Research and Development Center, and some of the world's most talented (and inexpensive) software engineers. How to get around: Forget public transportation. Auto-rickshaws are everywhere and charge about $1.50. Taxis are easily found at hotels and taxi stands, and a car with a driver costs about $3.50 per hour or $9 for a four-hour tour. Try Hertz for rentals (476 Adugodi-Koramangala Main Road; 91-11-4184-1212). Where to find free Wi-Fi: Coffee World (86 Brigade Road; 91-98-8029-8505) is an uncrowded chain of living-room-style cafes with creamy frappés and sweet treats. Where to get a trim: Bangalore has hundreds of small barbershops offering haircuts for less than a dollar, but most Westerners pay $10 at Bounce (First Floor, Magnolia Towers, Vittal Malya Road; 91-80-4132-9100). Best place to get down to business: Sunny's (34 Embassy Diamante, Vittal Malya Road; 91-80-4132-9391) serves European and Indian food and is popular with the IT crowd. It's relatively quiet, so you can talk. Best place to celebrate closing the deal: The 80-year-old Mavalli Tiffin Rooms (Shop 14, 11 Lalbagh Road, Wilson Garden; 91-80-2222-0022) is famous for its South Indian food. It's also cheap. The Thali meal - with vegetables, lentils, bread and rice - costs about $2. 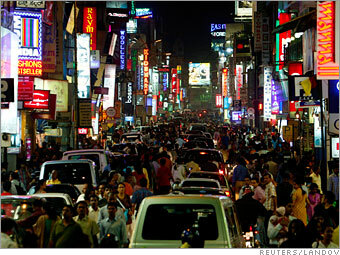 What you might not know: Residents call their city Bengalooru. Like Bombay (now Mumbai), the city was renamed to make it sound more Indian and less British.